TS SSA Staff Recruitment 2017 Notification - KGBV/URS SOs, CRTs, PETs, MIS, DEOs,IERPs Posts:Telangana Sarva Shiksha Abhiyan, TS SSA Staff, URS Staff, KGBV staff Recruitment 2017 in Telangana State. 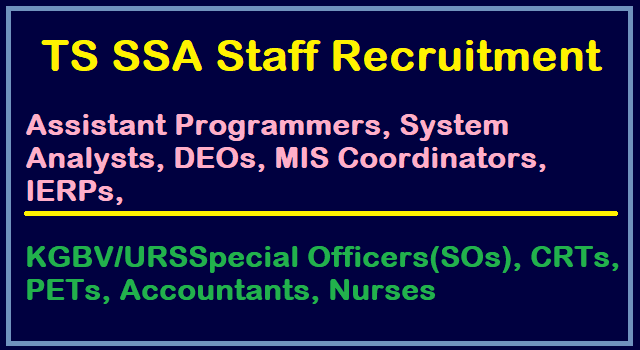 TS SSA Assistant Programmers, System Analysts, Data Entry Operators, MIS Coordinators, IERPs Recruitment 2017. KGBV/URSSpecial Officers(SOs), CRTs, PETs, Accountants, Nurses Recruitment 2017. (5 years relaxation for SC/ST/BC and 10 years for PHC). (ii) The Rule of reservation and Presidential orders shall be followed while engaging the field level persons. 6. Scheme of Examination: The selection of candidates for engaging to the posts will be made by written test (online/ offline). a) Special Officer KGBV · Post Graduate Degree and B.Ed. · Qualified in TET Exam - Paper - II. b) CRT · Degree in concerned subject and B.Ed. · Qualified in TET Exam- Paper - II. c) PET Intermediate with D.P.Ed. / Degree with B.P.Ed. a) Special Officer KGBV · Post Graduate Degree and B.Ed. · Qualified in TET Exam - Paper - H.
b) CRT · Degree in concerned subject and B.Ed. · Qualified in TET Exam - Paper - II.